register to receive a second entrée (of equal or lesser value) for free. 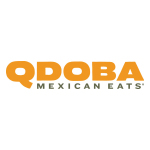 member or a QDOBA team member. cream, and spiced up with in-house pickled jalapenos. Queso, sour cream and in-house pickled jalapenos.